Salad is one of the most versatile and beloved staples in a healthy eaters life. 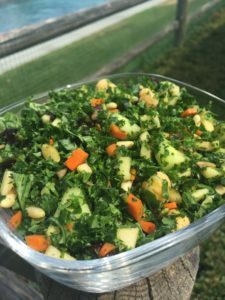 There are infinite ways to concoct and construct a salad, and keeping them healthful is super simple if you know what you’re doing. Far too many of us think we’re making solid choices at our favorite salad joints, but are we? Here’s your formula for a salad to send you on the streamlined path to meeting your goals. It’s recommended by the USDA that adults consume 2 cups of dark green leafy vegetables each day. There is no better spot to meet that recommendation than at the bottom of your salad bowl. This does not have to be boring. Choose spinach, arugula, dandelion greens, spring mix, herb greens, mesculin, kale, collards, turnip greens, chard, romaine or cabbage. Tip: do not use the foundation of your salad for grains, even if they are whole grains. You’ll wind up eating more calories than you need and lose the opportunity to get the micronutrients and water volume you need from your greens. Say yes please to the veggies that are raw, non starchy, fresh and fabulous. Even the biggest pile of these favorite veggie toppings won’t add up in the calorie department, but they’re loaded to the brim with fiber, micronutrients, vitamins, minerals and antioxidants. Yes to the cucumbers, sprouts, tomatoes, radishes, carrots, celery, artichokes, hearts of palm, peppers, onions, fennel, zucchini, mushrooms and herbs. Tip: starchier vegetables are also loaded with good nutrients, so it is absolutely OK to add some corn, roasted squash, edamame, peas or beets, but keep in mind these are higher in calories and less dense with water, so use them mindfully. Don’t make the mistake of passing on the protein. It will increase your satiety and makes your lunch more interesting. Choose organic steak or chicken, wild salmon, pole caught tuna, or shrimp as top animal sourced proteins. Don’t forget that a hard boiled egg, lentils or beans are also fantastic protein sources and a great meatless choice to get your protein in. Tip: most salad places offer you a nearly perfect protein portion of 3 – 5 ounces. Keep this in mind when you’re portioning your dinner. It can help you estimate how much you should be eating. You absolutely need a serving or even two of fats to bring out all of the nutrient benefits loaded in your salad. A salad without fat is not going to be as filling or delicious as possible. Make your choices carefully, knowing that a little feta, parmesan, olive oil, dressing, seeds, olives, nuts or avocado are a good addition to your greens. Tip: opt for the cleanest fats offered that have the most flavor. The more processed the ingredient, the less healthful it is likely to be, which is why olive oil with lemon juice trumps processed salad dressings most of the time. Are you tempted by the “treats” like croutons, tortilla strips, dried cranberries, mixed mayo-based salads or bacon bits? The goal is to make your salad so delish that you don’t want to ruin it with these toppings. In fact, a well constructed salad will satisfy you without the extras and you’ll feel great about eating it on a regular basis. Tip: plan your treats and mindful indulgences regularly. They have their place. Do not put them on your salad on impulse, but rather plan for them separately from your lunch.